Located 55 km southwest of Cologne and 43km away from Bonn, the Bruder Klaus Field Chapel is a remarkable work of religious architecture set at the edge of a field near Mechernich. Last fall, we had the chance to stop by during a short one-week road trip around the North Rhine-Westphalia region in Germany. 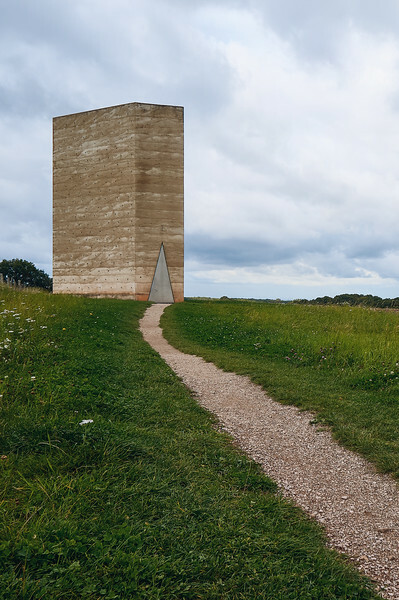 While doing research online about interesting sites to see along our route, I found that we would be driving close to the Bruder Klaus Kapelle, a small chapel commissioned by local farmers to the award-winning Swiss architect Peter Zumthor. Since the experience somewhat reminded me about our visit to the Doorkijkkerk in Belgium, I insisted on making the detour to have a look. And I’m glad we did! About 20 years ago, Hermann-Josef Scheidtweiler, the farmer who commissioned the work, was looking into building a chapel on his land to give thanks for the happy life his wife Trudel had led. He also wanted to dedicate the site to St. Niklaus von Flüe, also known as Bruder Klaus, a 15th-century hermit and holy man who is the patron saint of Switzerland and of Germany’s Catholic Rural Communities Movement. Scheidtweiler had read about Peter Zumthor’s winning designs for an art museum in nearby Cologne and decided to write him a letter. Coincidentally, Bruder Klaus also happened to be a favorite saint of Peter Zumthor’s mother; a happy coincidence that likely influenced the architect’s decision to accept this unusual project. To build the Bruder Klaus Feldkapelle, a team of local farmers collected 112 pine tree trunks from a nearby forest. Those trunks were then set together in a curved conical shape that looked kind of like a tear drop. Then, several layers of concrete, containing a mix of local elements, were poured all around them, leaving only the trunk tops uncovered. After, the trunks were set on fire and they slowly burned inside the concrete structure for about three weeks. What’s left of them is their empty spaces and a charred interior. This unusual process also gave shape to the oculus above, which is completely opened to the sky and lets light and rain come into the chapel. In fact, this is the main source of light in the small dark interior. Another peculiar element of the Bruder Klaus Chapel is its only door. Shaped as a triangle, the heavy metallic door also features a very distinctive lock. Additionally, from the outside you can see 350 small holes on the walls, which are covered with glass spheres on the inside. Besides being another source of light, these elements add a special touch to the atmosphere of the place. The ambience inside the Bruder Klaus Field Chapel is dark and mystical. It is a space that is thought-provoking and invites to introspection. The only elements you’ll find here are a bench, some candles, a sculpture of Bruder Klaus, and not much else. Just as other Peter Zumthor buildings, the chapel is in perfect harmony with its surroundings and is pleasing to the senses. All this makes this intriguing chapel a very remarkable piece of religious architecture; which is really worth the detour, if you find yourself travelling in the area. For us, the Bruder Klaus chapel was a nice highlight of our road trip. It is a construction full of symbolism that features great attention to details. This is definitely a must-visit for architecture fans, specially those who like minimal design. Entrance to the chapel is free. You can park your car, for free, in Wachendorf. From there, it is a 20-minute walk to get to the chapel. As this is a religious place, be mindful of other visitors. During summer, the chapel is open from 10 am to 5 pm (During winter, from 10 am to 4 pm). The chapel is closed on Mondays, except on Easter Monday, Whit Monday and Christmas. Have you visited the Bruder Klaus Field Chapel? How did you like it? Do you have any recommendations for things to see or do in the area? Leave a comment and let us know!